Change isn’t easy. Although your current TMF system may no longer align with your team’s goals, the prospect of migrating to a new eTMF system can be intimidating. Selecting the correct eTMF system for your team’s needs is only an initial step. Deployment of a new eTMF system requires training, updated processes and SOPs, complete QC of your current TMF, and the potential for manual metadata intervention. The risks can make sticking with an outdated TMF system seem worthwhile—so how can we decide if and when to migrate? 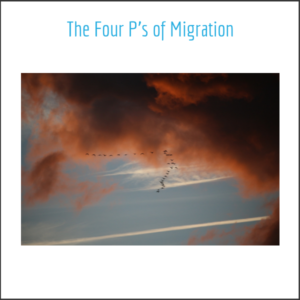 Identifying and understanding your Four P’s of Migration: Purpose, Position, Process, and People, is your first step to migration confidence. Each of the Four P’s of Migration acts as a signpost on your migration journey, ensuring your objectives, resources, systems, stakeholders, are properly aligned to succeed in this high-stakes undertaking. Why do you want to migrate your system of record? Do you seek to eliminate the burden of paper documents? Do you desire increased inspection readiness? Are you hoping to increase TMF oversight or shorten timelines? Your purpose for TMF migration will drive your TMF system selection and your migration plan. A clear purpose also motivates your stakeholders and secures the resources necessary for migration. What is the current status of your organization and the TMFs you wish to migrate? When transitioning from a legacy system to a modern eTMF, it is tempting to focus solely on the future. TMF migration, however, is a journey: where you begin is as important as where you wish to go. Preexisting factors like a recent merger, cost-cutting pressures, or ongoing TMF health crises could all impact the feasibility, timelines, cost, and risk of your migration project. An eTMF is more than just hardware. Selecting an eTMF system is just one part of the migration process. Your eTMF system must be integrated with your overall quality and compliance systems. The work instructions, SOPs, and workflows used for your legacy system must be modernized alongside your eTMF hardware and software. Even the most advanced eTMF system will feel antiquated if not supported by modern processes. The TMF migration process will mean disruption to your clinical operations team. During the migration process, consistent leadership ensures that business objectives are met and TMF health is maintained. A beginning, middle, and end to the migration process should be defined, so that TMF stakeholders understand when and how their roles will be impacted. All new processes and tools must be accompanied by training. Without the support of your TMF stakeholders, your TMF migration is unlikely to succeed. TMF migration is a complex journey requiring the balance of competing factors as well as the acceptance of risk. Understanding where you are, where you are going, how you will complete your journey, and who you will be traveling with is paramount to arriving safely at your migration destination. Remember, if you are ever feeling lost on your migration journey, LMK’s experienced migration guides are ready to return your team to the right path.